Freeware Tools for your creative impulses! Thank you music programmers! is a clever program that composes music and saves it as a MIDI file. Select the style you prefer, choose a key, chord progression, even a type of scale to use, hit the "Compose and Play" button, and the program does the rest. You can also select the level of complexity in the melody and harmony, and you can orchestrate your selections with sounds ranging from strings, to distorted guitar, to a dog barking. Any MIDI files created with the Automated Composing System belong to the user of the program. This program is useful for creating music to use for your Website, or generating musical ideas, or other purposes. Plus, it's fun to play with, and it's free. (virtual music) is a free application that allows the user to display sheet music and flip pages without removing the hands (or feet) from the instrument the music is performed on. It is very useful during concerts and practice sessions. | Music stands are usually able to accomodate at most a single book or 2-3 pages of loose leaf music at once. When performing a longer piece of music, the musician must often move one of the hands away from the instrument to turn the pages. This interupts the performance and breaks the flow of music especially when the page turn occurs during a musically demanding passage. | This software allows the user to create "songs" out of sheet music images obtained from a scanner, digital camera, or pdf, and "PlayLists" out of the "songs". During a performance, the user can simply press a mouse button to move to the next / previous page or press various keyboard keys to advance the music. | USB foot switches are available which emulate mouse button presses thus freeing the hands to play the instrument. Even without a FootSwitch, using a laptop display avoids the problem of books that don't stay open, or loose leaf pages that fly off the music stand when the wind (or HVAC unit) blows. "The Rock Band drums are nice and all, but practicing on your PC along with your own music is great"
Free Drum Machine on PC - Works with Rock Band Drum Set!! | "application that allows you to play your rock band drum set freestyle. This application lets you reassign each pad to whatever you want (including .wav files of your own), save pad settings, and record/playback your playing. Pretty great considering it's FREE"
This site offers a nifty roundup of free software programs for Nokia mobile phones. Free programs here include Ringtone Converter, which lets you quickly and easily enter ringtones into your Nokia phone. Contains pointers to educational software of interest to music teachers and students. Everybody likes getting something free. That's one reason the Internet is so popular - you can find tons of software available at little or no cost. We're not talking about pirated software, either. Many software producers actually make their products freely available, or offer free programs in the hope that you will eventually want to pay for them. Google). MXPLAY currently has plug-ins for Last.fm, MP3tunes and Nintendo WiiMote. Denemo is a graphical musical score editor, and serves as a frontend to Lilypond. Runs on Windows and Linux. Free western music notation package written in Common Lisp. For advanced computer users, because one needs to compile it using a LISP compiler before being able to run it. It can run on NeXTstep with ACL, Clisp; SGI with ACL, Clisp, or CMU-CL; Linux and ACL or Clisp; Mac with MCL. Free Music/Song Editor for Windows. Musette simplifies creation and distribution of public domain songs as lyrics and music are included together in one file. Special features help create, edit, play and print scores and songs, even if you're not familiar with music notation. Freeware. Unix/X. Integrated MIDI sequencer and musical notation editor. It is free software for Unix and X, running on machines such as SGI IRIX workstations and Linux PCs, and now also OpenVMS. Download MusicIP Mixer 1.7 Now with tag fixing! This software can play all kinds of real audio files and record them in PCM WAV format. It has resampling function with good quality using Digital Signal Processing algorithms. A great tool to help you create your own audio CD Allows you to play (optionally record at the same time) either online or locally. Can select multiple files and play/record continuously as a batch job This is a free software for personal use only. It has been tested on Windows 98 and Windows NT 4.0. It is a beta version. Run at your own risk! mpTrim is a simple and easy to use MP3 editor. Use it to clean-up and improve your MP3 collection. Plays MIDI and Karaoke files, complete with lyrics. Jet Audio is integrated, multimedia software made of a single compact rack. Not only does it play various music and video files, it also has features such as CD burning, recording, and conversion to other file formats. Nicknamed the Swiss knife of audio Music Converter is a must in the world of audio, transforming your PC into a true multimedia tool. Quartz AudioMaster Freeware is a powerful, yet easy-to-use audio and MIDI sequencer for Windows 95/98/NT/2000. It features four stereo audio tracks, 16 MIDI tracks, effects plug-ins, a per-track EQ, Aux buses, video sync, score, GM/GS/XG, and piano roll editors. It also has all the capabilities required to easily share musical projects across the Internet. Chart Wars is a freeware music industry simulator putting you in charge of your very own record company. In this role you ust hire bands, release and promote albums and singles, arrange tours and much more, all whilst attempting to balance the books, manage the growth of your label and compete with intelligent computer opponents. Burn your own data and music CDs with this freeware. It is Windows Front End of the popular Linux CD recording software 'cdrecord'. Includes Windows version of cdrtools/cdrecord. Supports data, audio and mixed mode CD burning, multisession CDs, audio CD extraction, and CD-RW erase. Has Multilanguage abilities. This freeware player suits best for playing back and showing the embedded lyrics of our Musyx MP3 karaoke files. Lyrics are displayed synchronously to the music. The font style, grade, and color can be set as desired. Free CD Ripper 3.0 is a freeware program and easy to use. Free CD Ripper 3.0 is a powerful, professional software which can extract Digital Audio tracks from an Audio CD into sound files on your hard disk. You can save CD audio tracks to CD-quality WAV files or encode them to OGG Vorbis or MP3 compressed audio format. Moreover it can encode existing WAV files to Ogg Vorbis or MP3 format, and window media audio file('wma' format). With its powerful sound engine, Free CD Ripper 3.0 extracts with high speed and quality. Free CD Ripper 3.0 supports Freedb and ID3 tagging so you can automatically download CD track information and it them in the encoded file. Play back all the sound you extracted in the player with many music function. Free CD Ripper 3.0 can convert to four formats of audio files. It supports wav, mp3, wma, ogg - these four kinds of popular audio frequency formats, and it would not produce new medium files. If you're drowning in a sea of CDs, DVDs, and MP3s, this freeware media-management program may be the life preserver you need. After the quick setup process, Mega Disc recommends that you restart your computer. Don't bother. Jump right in and start poking around the bare-bones interface. Mega Disc organizes your media in virtual storage units that hold up to 999 discs. Just insert a disc in your drive, and the program registers its basic stats and queries the online CDDB database for label, artist name, and much more (you have to register your computer with CDDB, but it takes less than a minute). Mega Disc tracks discs taken out of storage and notes when they're returned. And while the tree-based search function is hard to find, it's powerful once you do. We recommend this software to people who spend more time flipping through their media collection than enjoying it. "Download.com"
Carta Musica is a programme that prints out blank manuscript music paper. You have the possibility to print 5-line staves and/or 4-line/6-line guitar tablatures, with or without the clefs printed at the beginning of the staves (you can choose among treble, alto, bass, low-8va treble and TAB clefs). You can choose among 10 pre-set, single or multi-staff layouts (guitar, piano, SATB choir, string quartet, etc. ), or compose your own (with up to 6 staves). "You can freely set the page margins, the line thickness and the spaces between lines, staves, and systems or also add a footer to be printed on each page. Settings can be stored in files and thus easily re-loaded, so giving the user the possibility to have multiple templates. Preview is fully supported." Small program to display guitar chord diagrams. From A to G, major, minor and 7th, uses easy patterns for the beginner. In response to numerous requests, Chord Diags version 2 now includes finger positions to suggest which finger goes where." Convert audio files easily from one format to another. From the developer: "One of those must have utilities, indispensable for converting audio files from one format to another. Part of dMCs formidable arsenal, is its ability to rip music straight from Audio CDs!, or LPs [optional install]. Straight out of the box dMC can convert to and from Wave, Mp3 and from CD Audio (CDA) files. Codec downloads add Windows Media Audio v8 (WMA), Ogg Vorbis and many more types to the table. Features include: Volume Normalization - have all audio tracks use same volume. ID Tag preservation & Editing - keep those ID tags between conversions, Explorer Audio Info Pop-ups - display useful information on an audio file in explorer, Convert To - simplest way of converting right click on a file and select Convert To." Get started in composition or expand your harmonic repertoire with Arranger's Tool. Play your melody with the mouse on a simulated piano keyboard and Arranger's Tool software will harmonize it for you. Make changes to the harmony until it sounds the way you want. a freeware integrated text editor/player/viewer for abc music files. professional quality music notation system for all 32-bit Windows platforms. Focussed entirely on the printed page it is above all a What-You-See-Is-What-You-Get visual system. 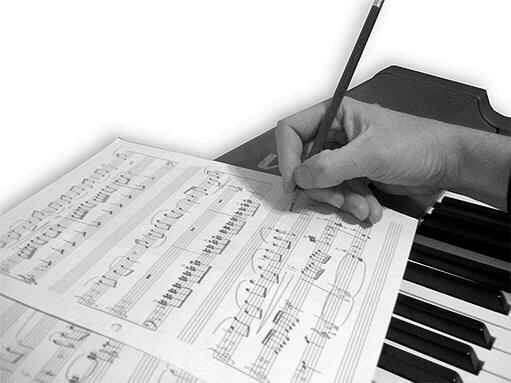 The philosophy of Music Publisher is that it is simply a replacement for pencil and paper. If you want a particular effect on your score which "breaks" the rules of music then Music Publisher will not argue! Above all it produces the notation you want to see and does not impose its own rules. for the Palm, the AirGuitar Wireless Lyric and Tablature 1.0 allows you to access a network of tabs and chord progressions. Zel is free music software for making MIDI files which you can play through your soundcard, attach to your web pages or use as a ringtones for your phone. You don't need to play an instrument or understand music notation and you don't need to own or play a MIDI keyboard or MIDI sequencer to create MIDI music with Zel. Zel can even compose for you. Bottom of page | This advanced jukebox software is for playing MP3s and ripping, burning, and managing a digital music collection. It encodes to MP3, WMA, OGG, and APE. The Media View feature gives you control over file organization. It supports more than 20 media file formats, including MP3, RealMedia, Windows Media, and QuickTime. The Find CD feature lets you search for purchasable music by the currently playing artist. Tune into Web radio or watch TV/DVD on your PC. A Visualization Studio feature lets you create your own savable visualizations, and a DSP Studio allows customization of the listening environment. Other utilities include Media Scheduler for sleep, alarm, and recording functions, and Media Editor for editing sound files. The new Download Manager utility works seamlessly with sites such as Emusic.com for easy download and playback of tracks and albums. This tool slows down or speeds up music, either from a WAV or MP3 file, or directly from a CD. You can also change the pitch of the music without affecting its duration. The processed audio can be saved to disk. Sonique provides a wonderful, eye-catching control panel while offering numerous options and configurations, including tempo increase and decrease, equalizer and balance control. There are quick links available on the main window of the program that will take you to Sonique's home page, Sonique music, music news and a concert guide. The My Sonique section gives you quick links to more skins, plug-ins and a help file. This utility can quickly retrieve your favorite lyrics from 120,000 songs. All artists are listed in alphabetical order with their albums. You can save, edit or print the lyrics and even get MP3s. Other features include local search support and an Internet search assistant for lyrics and MP3s. This program helps you find your favorite music in MP3 format on the Internet. It searches for a song through user-specified keywords, in all popular MP3 search engines. It also verifies whether the links are valid, and it can pass the links to a user's downloading program or copy them to a Windows clipboard. This CD ripper allows you to extract audio files from a CD and convert them to MP3 format. It can automatically retrieve title information from the CDDB database, normalize the output files and supports additional LAME options. You can also use the software to record to MP3 with your microphone, or to convert WAV files to MP3 format. This is a tool to edit MP3, MP4, M4A, OGG Vorbis, OptimFROG, Musepack, AAC, Monkey's Audio, FLAC, True Audio and WavPack files. It can rename files based on tag information, replace characters or words from tags and file names, import and export tag information, and create playlists. The program supports freedb database lookups for selected files. Free Media Player - Mp3 Players : Quintessential Player is a fully skinnable audio player that uses a plug-in architecture, allowing it to be as simple or as feature-laden as you like. Go for a minimal installation to preserve system resources, or add a variety of visualizers, library functions, DSP filters, language packs, and other plug-ins to extend the player's capabilities. Quintessential Player has full support for most popular audio formats, including MP3, MP3 Pro, Ogg Vorbis, WAV, and Windows Media. Other convenient features include CD ripping, MP3 encoding, cross-fading, and CDDB integration. Also, Quintessential allows you to listen to streaming audio from broadcasters such as Shoutcast and Icecast. Version 4.1 adds a new encoding UI and many small enhancements. It is a metronome, a tuner, and more. Igor Engraver is an extremely powerful program. Yet it has been designed to be very easy to use for beginners and experts alike. At the same time, Igor Engraver offers the professional engraver powerful control over all aspects of the notation of music. In addition, it offers full built-in support for e-commerce, allowing you to produce portable, fully cross-platform scores which can be published on the Internet. an integrated suite of powerful, interactive music calculating tools for musicians, sound engineers and producers. It's a 32 bit package which works with Windows 95, 98, 2000, NT, ME & XP. It is of interest to both experts and beginners alike. Clarion is a simple tool for practicing the recognition of musical intervals. It supports the QuickTime music architecture, so the user can pick from among all of the available synthesized instruments installed on the Mac. You can have the program play a desired interval, or have it quiz you on the selected intervals. ower Tab Editor is a tablature authoring tool for Windows 9x/NT/2K/XP.B It allows for the creation of tablature scores that can be printed out and played back via MIDI.B Features standard music notation and symbols as well as all of the popular tablature symbols.B Can import MIDI tracks, and can export to ASCII Text, HTML and MIDI format 1 files. Helps you catalog and categorize your sample sounds. You can also categorize your channel, effect and other setting or preset files you might have in your music production. Features: custom libraries, customizable categories, category filtering with boolean support, support for export/import of category templates, drag and drop to/from other music programs, customizable file format support, powerful boolean search, one click category assign, user comments for individual libraries and samples, easy sample preview, Windows Explorer style interface, full documentation in HTML Help format. DELAY TIME CALCULATOR | DELAY TIME GRID | METRONOME | TAP TEMPO UTILITY | CHORD CUE | THE VIRTUAL GUITAR | THE SONG LENGTH CALCULATOR | THE STOPWATCH | A SAMPLE CALCULATOR | PRINTING FEATURES | Limitations of the freeware version: Chord Cue, Virtual Guitar and Sample Calculator features are only available for a limited time. jambientFREE lets you use a joystick (or mouse) to sculpt sound in 4 channels simultaneously, and move in sonic space. Designed to allow live performance of electronica, ambient and audio collage style music, it is also great for studio or theatrical sound effects. Midi Thru is for use with either OMS or Midi Manager. If you don't know what these are, then you don't need Midi Thru. Midi Thru simply connects a controller synth to a slave synth. Midi Thru allows you to slave up to six synths, sending on the midi channels of your choice. It's great for those times when you don't want to fire up a major memory eating sequencing program to use as a midi thru or when you want to write lyrics in your word processor and don't have enough memory left to fire up your memory hogging midi sequencer or if you just want to jam on that favorite synth module. Its a simple program that does one thing and one thing well. It's a Midi Thru !!!! Midi Thru works on any mac running sys 7.0 and up with at least 2.5 meg of free ram. Midi Delay is now a Fat Binary, which means it will run in the fast native mode on power macs. Free visualisation plug-in for MP3 players (Winamp and Soundjam) that accepts any visual files created for it. Freeware editor/librarian for the Alesis QS4/5. Free TablEdit TEF file viewer/player/printer for TAB/Standard Notation | View songs that are available from the internet in TablEdit file format on your computer screen. 4/4 and 3/4 time signatures | Humanize, Random Generator, and More. Delta SP is a Sequencer, Sampler and Synthesizer all in one executable. No external hardware or software required except the windows OS, a waveform output device (like on-board sound), and the software.-Full midi sequencer , many edit functions like quantize ,interpolate and transpose -Sampler - 128 banks with unlimited sam ples per bank, and 128 instruments per bank Instruments are multi layered and have many parameters . Like 2 LFO's , 2 Filters, Wave shaping , FM , Envelope , Distorsion , Pitch controls etc ... -Synthesizer - Modular softsynth supports Internal and Native plugins called "Synthcards",VST plugins and internal modular softsynth allows creation of own synthcards | -On line context sensitive help. The MIDInight Express II is a * free* real time, emulated wavetable MIDI jukebox and renderer. It runs with any 16 bit Windows sound card capable of playing 22050 Hz digital audio (DirectX 3 or higher required under NT). It can also copy its output to a WAV file for fast MID to WAV rendering. SetMaker is a computer application for rapid creation and management of Set Lists. Featuring an intuitive graphical user interface, SetMaker allows users to store song titles, styles, tempos, lengths, and more. It is also a fast way to create and print out Set Lists for any occasion. Whether you're a gigging musician, a worship leader, a DJ, or a music director, SetMaker can help you organize your songs and assist you in picking the best songs for your performance. SoundApp PPC 2.5 | Sound player and conversion freeware for PowerPC Macs SoundApp can play or convert files dropped onto it in a variety of formats. In addition, it supports Play Lists which are lists of sound files that can be saved for later usage. Files in a Play List can be played or converted as a group or individually. SoundApp supports a randomized shuffle playback mode and repeated playback of Play Lists. WaveCraft 1.0 | WaveCraft is a sample generating emulation of a modular synthesiser, with a wide selection of modules to choose from, including resonant low-pass and high-pass filters, glide, analogue sequencer and so on. It produces sample files in the standard WAV format as well as a raw format for other purposes. It is ideally suited for use with wavetable sound cards such as the AWE32, which can play WaveCraft's samples as musical tones with considerable polyphony and multitimbrality. WaveCraft was only previously available commercially; this official downloadable version is free, and lacks only the bulky library of pre-rendered sounds, although all the settings files required to recreate them are provided. TapeIt 1.0 | Silverspike TapeIt is a freeware VST-Plugin to record audio streams creating wave files. You can plug TapeIt into your VST host application at any point accepting VST plugins. Unlike most other plugins, TapeIt does not change the sound of your audio. But, while copying the sound unaltered from input to output, TapeIt writes it to a standard WAV file. This way you can grab any audio signal that appears at one of the plugin-points of your audio application. Randy Tab | Randy Tab is a Freeware guitar tabulature authoring application for writing guitar tabulature. AnalogX SampleSlide 1.03 | AnalogX SampleSlide is a DirectX plug-in that allows you to delay an audio stream by an arbitrary number of samples, as well as milliseconds, for up to seconds at 44.1 kHz. In order to use this plugin, you must have DirectX 6 or greater installed, as well as DirectX Media. You must also have a DirectX audio-compatible music application (like Paris, WaveLab, Cakewalk, etc) installed in order to use the plugin. It works with either a mono (1 channel) or stereo (2 channel) audio stream. Ambient Generators. | Up to 520 'analog' bandpass filters and a unique architecture that includes stereo harmonic effects in addition to resonance control, spectral envelope generators, internal carrier options, LFO modulators, and more. Sweet MIDI Arpeggiator 1.9.1 | Older synthesizers had arpeggiators, and now new synths can have them too with Sweet MIDI Arpeggiator. This 'virtual arpeggiator' program contains four arpeggio objects that will arpeggiate all MIDI notes that pass through it. m3ute2 | m3ute2 is program for copying, moving, and otherwise organizing M3U playlists and directories. m3ute2 can also generate detailed reports about lists of files. Bedevilled Audio System. BSE an abbreviation for Bedevilled Sound Engine, it implements all the neccessary music processing logic required by BEAST in a seperate reusable library. The "Bedevilled" portion of the names has no religious background, but merely refers to the complexity involved implementing such a "BEAST"
Phonics: Initial Consonant Sounds (Music CD and 20 Page Book Included) "2006"